Recently set up, the Pieces of the Past online shop is described by its proprieter as a “UK based vintage, rockabilly, pinup and tattoo scene inspired jewellery, apparel and accessory company”. Ok, so the tattoo thing is not really my scene (I’m not cool enough to pull a lot of artwork off and I’m not brave enough to take the pain! ), the vintage pieces are fabulous. Each and every piece of jewellery is hand made and limited to five or six pieces, with some even being one offs, which means that you can purchas bespoke pieces without the bespoke price tag and you can be sure that you won’t turn up to an event wearing the same as somebody else. 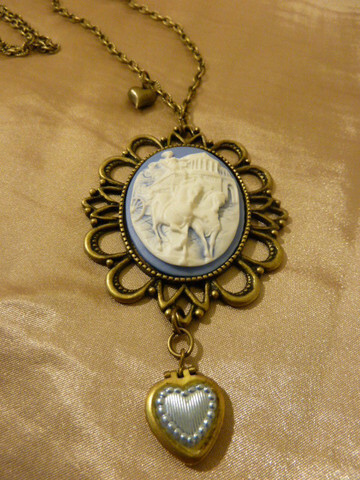 Among my favourite bits are the vintage inspired statement bronze necklaces and lockets like the Made in Rome one. These are perfect for adding accessories to a plain midi or a baggy shirt for a work wardrobe. 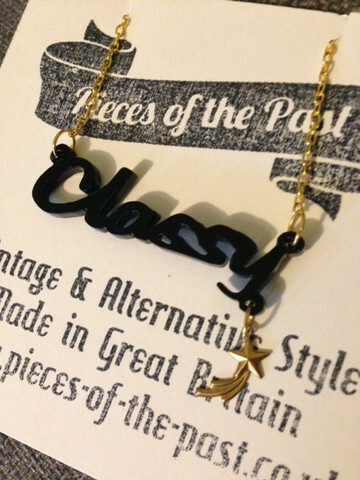 As well as these, Pieces of the Past offers a whole host of acrylic necklaces featuring statement words. They even offer a custom service where you can pick your own word and colour. Being a classy girl myself, I love this Classy one. And the clothing is not to be sniffed at either. The selection of swing dresses on offer really brings out the 1950s Stepford wife in me. I have been really enjoying cooking and cleaning for my fiance since we moved in together so maybe these are pretty apt for my new image! I especially love the sky blue one, I think it would be perfect with a blonde beehive. The website also stocks handbags, eyewear, lingerie and shoes including some super cute Mary Janes. So whether you want to channel your inner punk, 50s housewife or you just want a piece to make people talk, then Pieces of the Past is definitely worth a visit.